If you are a Pumpkinvine “regular,” chances are you might have seen Lori Copsey on the trail. 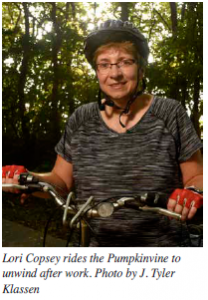 A 25-year Goshen resident and avid cyclist, Lori Copsey lives near the library, so it’s convenient for her to access the trail at Abshire Park where she begins most of her rides on the Pumpkinvine these days. Before the Pumpkinvine was built, Lori would ride the Millrace Trail in Goshen, because she doesn’t like to ride on the street. However, once the Pumpkinvine opened, it quickly became her trail of choice. “I prefer to ride on the Pumpkinvine, because I like to go hard sometimes, and there aren’t as many walkers,” Lori says. For her, riding the trail has physical and mental benefits. She has a busy yet rewarding career as a Behavior Consultant for the Elkhart County Special Education Cooperative (ECSEC), which serves the Baugo, Concord, Fairfield, Goshen, Middlebury and Wa-Nee school systems. Here, Lori meets with teachers to develop behavior and medical plans for students, ages 3 to 22 who have significant disabilities. Her job is to maximize each student’s independence so that they can grow to their full potential and meet their goals with dignity. Every decision is a “heavy” one because a person’s ability to thrive is at stake. completes a 12-mile ride in the evening before it begins to get dark. “I look forward to my rides. I’m able to reframe problems and turn them into opportunities. This reduces stress and lets me focus on other things at home,” Lori says. That’s the beauty of cycling (or doing any exercise) in the fresh air: improved creative thinking and problem solving. After a long session on the trail, Lori, feels revitalized, more positive and less tense, which is always a good thing. And, it’s a bonus (beyond physical activity) that the Pumpkinvine can deliver for anyone.